The Short Life and Sad Death of Edward the Martyr – History… the interesting bits! Poor Edward the Martyr is one of the great ‘what ifs’ of Medieval history. It’s not that he was anything special in the kingly department, it’s simply that he didn’t get the chance to be – or to not be – any kind of king. And then Edgar formed a 3rd and final relationship that would have far-reaching consequences for his first-born son, Edward. Edgar married the daughter of Ordgar, a powerful Devon thegn who died in 971. Unlike Edgar’s previous ‘wives’, Ælfryth was crowned and anointed as queen, following her marriage with Edgar, which was officially blessed by the church. Ælfryth gave Edgar 2 sons; Edmund, who died in 971 and Æthelred, born in 968. Both Edward and Edmund appear in a charter of 966, as witnesses to the foundation of the New Minster at Winchester. Curiously, Edward’s name appears below that of his half-brother, suggesting Edmund was regarded as his father’s heir, rather than his older sibling. Little is known of Edward’s childhood; according to Byrthferth of Ramsey he was fostered for some years by Sideman, bishop of Crediton and protégé of Ælfhere, ealdorman of western Mercia and the most powerful ealdorman in England at the time. When his father died in 975, Edward, at 13 years of age but with doubtful legitimacy, was one of 2 rival candidates for the crown. Edward was up against his baby brother, Æthelred; undoubtedly legitimate but only 6 or 7 years old. With both too young to make an independent bid for power, each boy was backed by court factions. Æthelred’s mother, Ælfryth, garnered support for her son from Æthelwold, bishop of Winchester, Byrhtnoth, ealdorman of Essex, and Æthelwine, ealdorman of east Anglia and brother of Ælfrythf’s 1st husband. However, Edward had the backing of ealdorman Ælfhere and, possibly, Oswald, archbishop of York. However, the crucial support came from Dunstan, the highly influential and saintly archbishop of Canterbury, who crowned Edward personally. We know very little of Edward the Martyr, and what we have is contradictory to the extreme. According to Byrthferth, Edward himself was known for having a hot temper; a temper which instilled fear within the people of his own household. However, Osbern maintained that men had a good opinion of Edward. 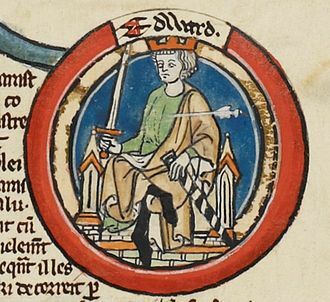 With Edward too young to rule alone, Ealdorman Ælfhere held the reins of government. Only 3 charters have survived, 2 of which were issued in Crediton, Edward’s childhood home. The regime’s influence seem to be very limited the further north you look, especially in the Danelaw. In the Five Boroughs region (including Stamford and Lincoln), coinage was below the standard of that of his father, Edgar. The short reign was overshadowed by a backlash to Edgar’s previous ecclesiastical policies, seeing a violent reaction against the expansion of the reformed monasteries; however, Edward retained the support of Dunstan, who did much to influence church policy and direction. Dunstan’s influence saw him call a meeting of councillors in Calne in 978. Held in an upper room, the meeting turned into disaster when the floor gave way. Many councillors were killed or injured; however, Dunstan, possibly in his early 70s by then, miraculously survived when the rafter on which he was standing was the only one that didn’t give way. Edward seems to have been benevolent towards his stepmother, bearing her no ill will following her attempts to claim the throne for her own son. He allowed Ælfryth to claim her part of his father’s dower and thus confirmed her jurisdiction over the whole of Dorset. 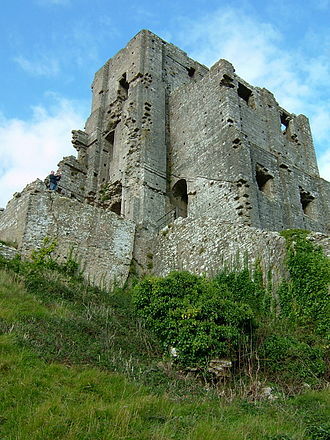 She and Æthelred settled at Corfe, a castle and large estate in the Purbeck Hills. Ælfryth, however, seems to have been less forgiven and wasn’t willing to settle for her son being Edward’s heir. When the opportunity presented itself, she jumped at it, with few qualms. In March 978 Edward had decided to visit his half-brother at Corfe; arriving on the evening of 18th March, with only a small band of men accompanying him. According to the chronicles, he was met at the gates of Corfe Castle by Ælfryth’s retainers; he had probably sent ahead to warn of his arrival and would have expected a welcome, someone to take his horse and lead him into the castle. Sources vary, some suggesting that he was presented with a cup; so he could quench his thirst after a long ride. What is certain, is that Edward was pulled from his horse and stabbed – murdered. Following the stabbing, Edward’s horse bolted; with the dying king’s foot caught in the styrrup, he was dragged along the ground for some considerable distance. He was buried quickly and without ceremony somewhere close by – possibly Wareham. With Æthelred considered too young to be guilty, the finger of accusation pointed straight at his mother, Ælfryth. However, given the political reality of her position as mother of the king, it was expedient for her to remain beyond suspicion. Although the crowned was not conferred on Æthelred straight away, whatever the dowager queen’s actions, at only 9 or 10 years old, her son was now the only candidate for the succession. However, it was only after an interregnum and a period of negotiations that the crown was settled on Æthelred. 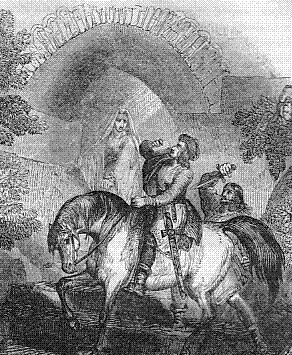 Almost a year after Edward’s death, the young king was exhumed by Ealdorman Ælfhere. 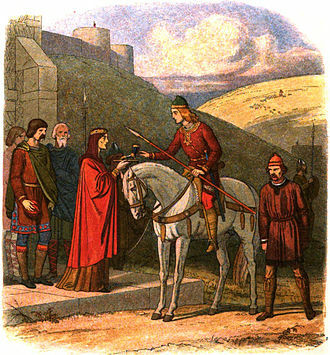 Edward’s erstwhile supporter stayed a couple of days at Wareham before escorting the body to the nunnery at Shaftesbury. It was only after Edward was safely re-buried with the honour to which he was entitled as king, that Æthelred was crowned by Archbishop Dunstan; on 4th May 979. During the Dissolution of the Monasteries in the 16th century, Shaftesbury Abbey was destroyed and Edward’s shrine lost. However, in 1931 his grave was discovered and his bones were removed to a bank vault in Croydon, as neither the Churches of England or Rome would take the relics for reburial. Tests on the remains, in 1970, seemed to confirm they were Edward’s, the injuries on the bones being consistent with the wounds Edward is known to have received. The young king’s remains were finally removed from the bank, in September 1984, to be interred in a shrine in the Russian Orthodox Cemetery at Brookwood, Surrey. And despite the fact Shaftesbury would like to have Edward back, so far as I can discover he remains the only Saxon king to be resting in a Russian Orthodox cemetery. Footnotes: ¹ Anglo-Saxon Chronicle quoted by Martin Wall in The Anglo-Saxons in 100 Facts; ² AS chart., S899 quoted by Cyril Hart in Oxforddnb.com. Sources: Brewer’s British Royalty by David Williamson; Britain’s Royal Families, the Complete Genealogy by Alison Weir;The Wordsworth Dictionary of British History by JP Kenyon; The Anglo-Saxons in 100 Facts by Martin Wall; Kings, Queens, Bones and Bastards by David Hilliam; The Mammoth Book of British kings & Queens by Mike Ashley; The Oxford Companion to British History Edited by John Cannon; oxforddnb.com. Hi Ethan, what do you need to know? Why wouldn’t either of the two churches not accept Edward for burial? And for that matter how did it come about that the Russian Orthodox Church came to the rescue? This is all fascinating stuff! The only reason the Orthodox church reveres him is they managed to procure his skeleton. They needed a decent relic and they didn’t care which. They refuse to give up such a precious relic – authentic ones being very rare, due to revolution – even though he bears zero relation to them. It is cultural theft and there ought to be a retroactive antiquities law against it; for example, like the American Indians Repatriation Act. I am not sure you can see it as theft, when no one in the Church of England or the Roman Catholic Church wanted anything to do with his remains. At ;east the Russian Orthodox Church were prepared to offer him a resting place. However, a repatriation act would achieve nothing when his remains have not even left the country. He has a resting place now, which is what should matter above and beyond any political or religious arguments. Another well-written article on a historical figure I’ve never heard of. Fascinating, and sad. It’s great that you’re bringing to light these lives of people who, until now, have been lost to history. Pingback: England’s First Queen, the Original Wicked Stepmother – History… the interesting bits! Going a little further back this time. Many years ago, I read several histories of Ethelred The Unready. Presumably this is one and the same. Now, having done ancestry.com for many years, I understand that he is my 34th gr.grandfather. Taken with a large grain of salt, for I don’t know if he ever had children. I read he was called The Unready due to the fact that he did not expect to be king, therefore was unprepared. Is this possibly so. I can’t recall where I read the stories, as it was 50 yrs ago. Hi Helen. Ethelred did have children – Edward the Confessor was his son, as was Edmund Ironside. Edmund was murdered, but had children and the queen is descended from him, through St Margaret, who was queen consort of Scotland. Ethelred also had several daughters – so it is a possibility that you are descended from him. The ‘unready’ name is a play on words. ‘Ethelred’ means ‘good counsel’ and ‘unraed’ means ‘bad counsel’, as he was such a bad king, people though it appropriate to add ‘unread’ which has changed to ‘unready’ over the years. And so we should be grateful to the Russians!! Hi, I was particularly interested in the account of Edward as I live quite literally at the foot of Corfe Castle and look across to the castle keep and walls from a bedroom window. I had previously thought that Edward was interred at Shaftesbury so was interested to hear about his true resting place. It is said that his body was initially cast into a local well and did not decay. Possibly a myth especially as supposed miracles attached to the well cannot be verified. Legends love stories such as this. Thankyou for filling in the facts , I regularly find myself sharing such as these to fascinated holiday visitors. The castle is imposing at all times of the year but at Christmas it is now illuminated and well worth a visit for that alone.